Sergeant 201730 Albert Henry Butler, 2nd/4th Battalion, Royal Berkshire Regiment. Albert was born in Newbury in 1896, the son of Walter James Butler and his wife Elizabeth née Maskell. He was the youngest of their three children, all sons, the others being Percy William (born 1890) and Walter Richard (1895). Walter senior was a carpenter and joiner, originally from East Ilsley (Elizabeth was from neighbouring West Ilsley). After the birth of Percy the family moved to Newbury, no doubt seeking better employment prospects. For a while they lived in Speenhamland at 1 Coniston Gardens, Park Lane before they moved to Cromwell Road, a house called Hodcott Villa. Today Cromwell Road is a part of Newbury, though some might claim it as part of Shaw – in the 1910s it was in an area known as Shaw Fields East which was within the parish of Cold Ash. Young Albert attended the Speenhamland School about a mile from Cromwell Road. After he finished his schooling Albert became a carpenter’s apprentice, possibly apprenticed to his father, perhaps as an apprentice to whichever builder or firm which was employing Walter. At this time Percy was working as a bricklayer’s labourer and Walter junior as a shop assistant. 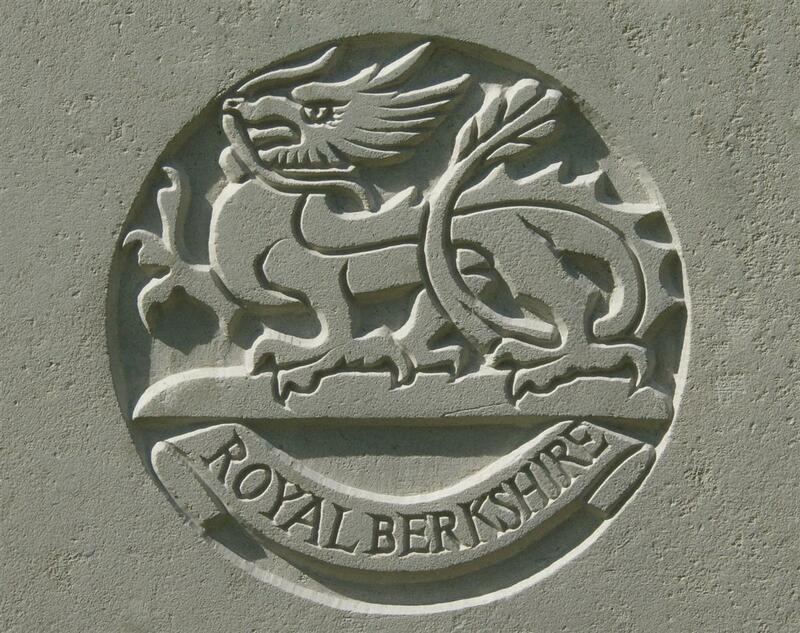 When war came in August 1914 Albert joined up immediately enlisting with the local regiment – the Royal Berkshire Regiment. He joined the 4th (Territorial) Battalion (4th Berks) and was given the regimental number of 5402. Territorials were part time soldiers who signed up to defend their country – not to take part in actions abroad; but the War Office very quickly realised that it would soon need as many as possible trained troops in France. Most Territorials, unlike Albert, had been serving before the war – once the Regular troops had been sent to France, the next best available troops in terms of training were the Territorials. So, in September 1914, the War Office asked all Territorials to volunteer for overseas service. About 70% of the 4th Berks agreed to do so, but 30% didn’t – the solution to this was to split the battalion into two – the 1/4th Berks was formed from the volunteers the remainder becoming the basis of a new battalion, the 2/4th Berks. Albert served with the 2/4th Berks. However, he received the Territorial Service Medal, awarded only to men who were in the Territorials on 4 August or earlier (Albert qualified by enlisting on the last qualifying day) and who volunteered for overseas service. So he must have volunteered despite the fact that he was too raw a recruit to send to the Front. So he was allocated to the home service battalion. As it was the 1/4th Berks did not cross the Channel until 30 March 1915, but, at the time departure appeared to be imminent. 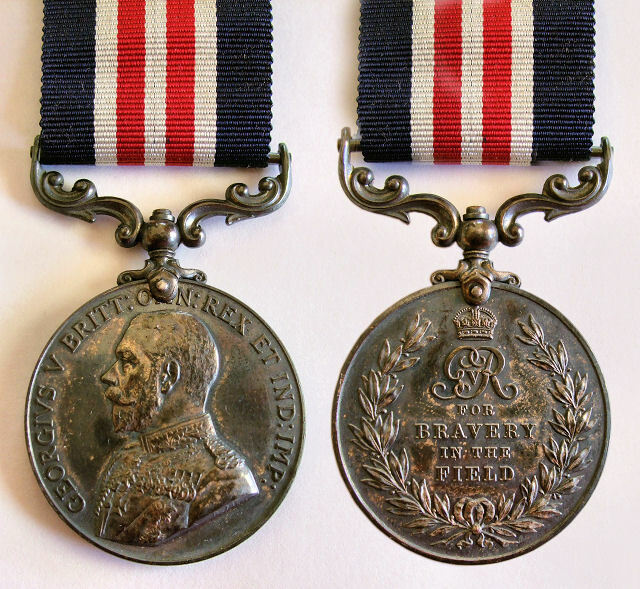 Lance-Sergt A H Butler, 184th LTM Battery, son of Mr and Mrs W J Butler, of Shaw, has won the Military Medal for good work in the line. Sergt Butler, who was a member of the Newbury Company Territorials, joined up on the first day of war with the Royal Berks, and after training in England, he crossed to France, where he has been on continuous service for two years, having had only one period of leave nearly a year ago. Proficiency in his work led to promotion, and at the same time that he received the Military Medal, he was made lance-sergeant. Happily he has escaped serious injury until now. 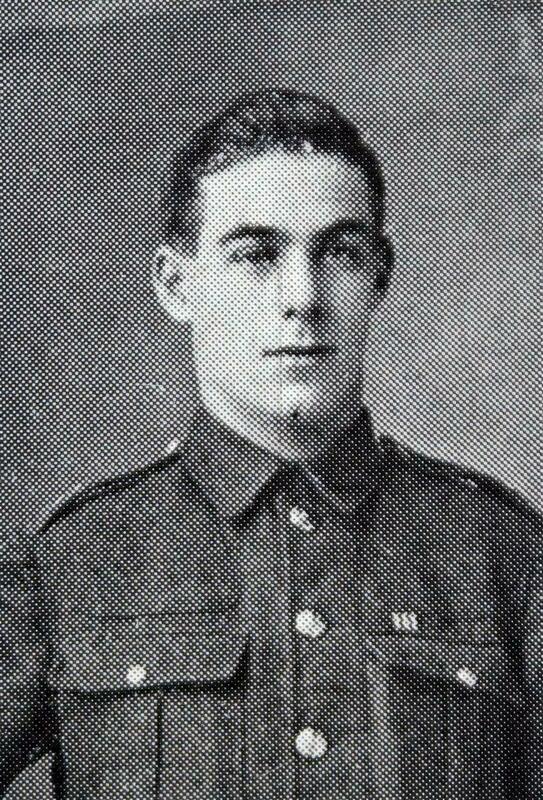 Mr and Mrs Butler have another son, Walter Richard, who is in the Grenadier Guards, and he is also serving in France. He has been wounded, but returned to the front on recovery. He was still with the battalion on 21 March 1918, when the Germans launched there greatest offensive of the war – the Kaiserschlacht (Kaiser’s War), also known as The Spring Offensive. The surrender of Russia had released large numbers of German troops from the Eastern front, when these arrived on the Western front the Germans had, for the first time in the war a significant numerical superiority, outnumbering the combined Allied forces by about 50%. Yet the Germans also knew that American troops were on their way in their thousands, soon the advantage would be with the Allies. 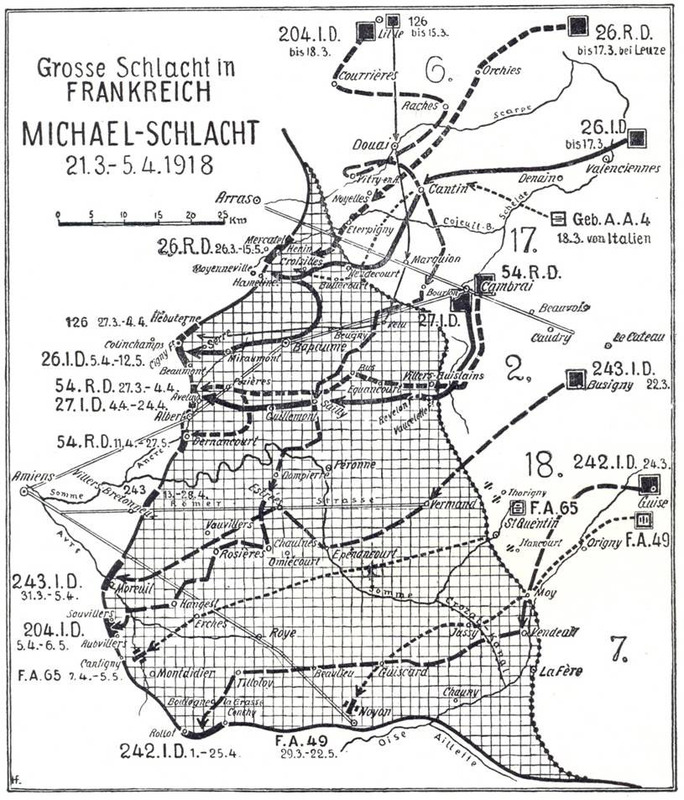 The first stage of the Kasierschlacht, Operation Michael, was a final throw of the dice, aimed at the junction of the French and British sections of the front near the River Somme it was an overwhelming assault. The combined weight of three German Armies fell on the British north of the Somme, mainly on Fifth Army. The line buckled and broke; hastily constructed defences a few miles back were not able to hold out for long. That first day the Germans advanced eight miles, recapturing out all of the territory lost to the British during the Battle of the Somme in 1916. Desperate defence gradually wore down the German attack, and, despite their success, German troop morale faltered. The troops had been told that the British were starving, existing on even less that the meagre rations doled out to the Germans – when they began to capture huge store dumps full of food the truth became evident; they had been lied to, it was Germany that was starving while the Allies fought with full stomachs. The German offensive stalled, two more efforts first to the north near the Franco-Belgian border and then to the south against an Anglo-French force at the Chemin des Dames also ran out of steam. The dice had been rolled, but the Germans had lost. On the dreadful first day of the offensive British losses were high, large numbers of troops being reported as ‘missing’. However, because this was an initially successful German offensive and huge number of British troops were captured – when the British were on the offensive a report of ‘missing’ usually resulted in a telegram from the War Office six months or a year later notifying relatives that their son/husband was ‘presumed dead’ on the day he was reported missing. On 21 March there was a much better chance that a loved one reported as missing would send a postcard home in a few weeks time, telling his family that he was safe in a POW camp. The 2/4th Berkshires were in reserve at Ugny when the storm broke; at 5am the order to ‘man battle stations’ was received. At 6.30 the men moved off proceeding to Railway Cutting via Marteville. They moved into defensive positions and waited. At 3pm the Germans struck in overwhelming numbers and the battalion was forced to retreat. Casualties were heavy, including the commanding officer, Lt Col H S Dimmer, VC, MC. Among those who did not answer the roll call was Harry; his family was informed that he was missing. Sadly he was not one of those who wrote home from a POW camp, he never heard from again. Nor was his body ever identified; his name is commemorated on the Pozieres memorial to the missing (panel 56). Although, strictly speaking, he home in Cromwell Road was in the parish of Cold Ash it was contiguous to, and generally accepted as part of, the town of Newbury - so it is not surprising that he is remembered on the Newbury Town War Memorial (tablet 10). More surprising is his non-appearance on the Cold Ash War Memorial and inclusion on the Cold Ash Roll of Service. Commemoration on the Cold Ash roll of service would generally lead to the assumption that he survived the war, especially as he does not appear on the parish war memorial that commemorates the dead. The memorial was unveiled in February 1919; perhaps Albert’s family were not yet ready to admit that he was dead? 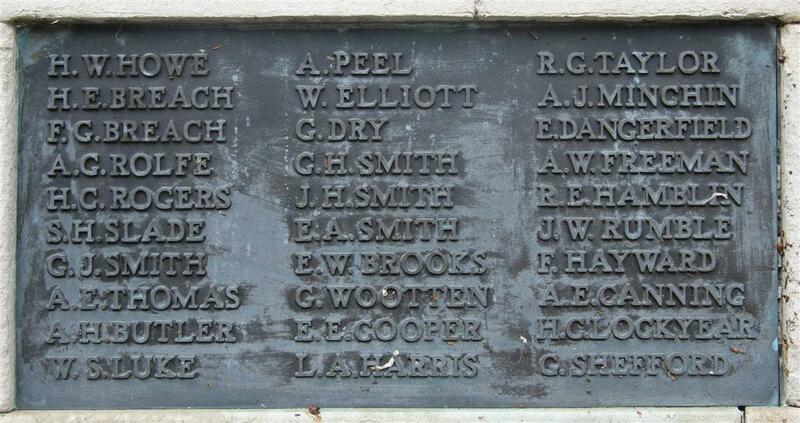 His time at Speenhamland School was remembered on the long lost school memorial.